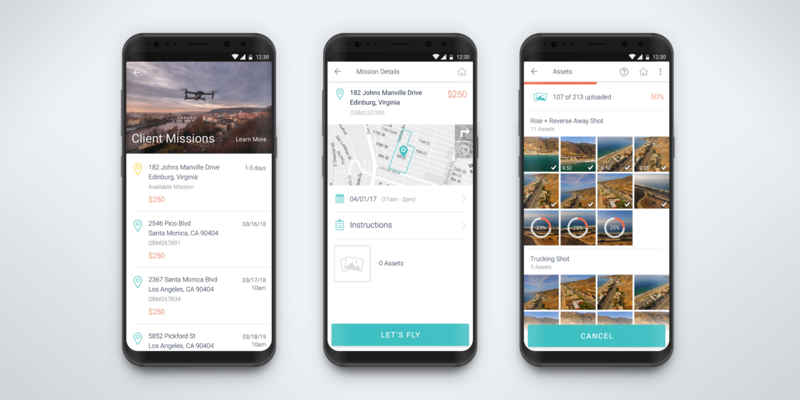 The DroneBase Pilot App is now available in beta on Android devices! About 10 months ago, we announced a major update to our iOS app which included an entirely new interface and other changes designed to make flying easier than ever. The tiled "Welcome" screen, for example, makes it easier than ever for Pilots to choose the type of mission they'd like to fly. Within Active Missions, our new "Let's Fly!" screen automatically associates all photos and videos with the mission at hand - a huge value-add for our Pilots. Finally, we're bringing our newest updates to Android users. As DroneBase CTO Eli Tamanaha previously said, "The more we can streamline the busy work, the administrative stuff like classifying and uploading imagery, the better." Our Android app is still in beta and has the same functionalities as its iOS counterpart, with the exception of AirCraft (coming soon!). "We're so excited for people to use the DroneBase Android app," Eli stated. "It will notify pilots of available missions faster, and allow pilots to fly those missions directly in the app, with an integrated shot list and everything." During the beta phase, Eli notes that we're "actively collecting feedback, so please tell us how your experience goes! We love all the drone pilots out there and hope this app adds a ton of value!" Android users, it's time to start flying. Download the DroneBase app in the Google Play store today! If you have any feedback, please feel free to email pilots@dronebase.com directly. Thanks for flying with us! In "Company Updates", "customers", "Product announcement"